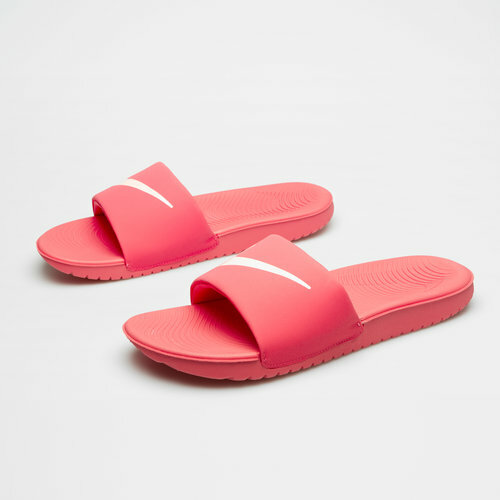 Ideal for popping on before you hit the showers or when you're pool side or at the beach, slip on a pair of these Nike Kawa kids Shower Slide Flip Flop in Pink and Bleached Coral. These men's flip flops features a soft synthetic strap that conforms to the natural movement of your foot. Its cushioned platform combines plush foam underfoot with a durable, lightweight outsole foam for long-lasting wear. Full-length wavy flex grooves keep the midsole ultra-flexible and a soft synthetic strap moves naturally with your foot. In a simple and classic look, make sure you don't go without these Nike Kawa Shower Slide Flip Flops.